Please check out the climate-friendly tour operators cooperating with atmosfair. 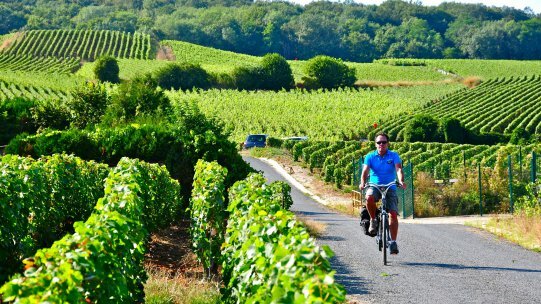 Join us on this extraordinary wine and bike tour exploring the beautiful hills of the Champagne region and tasting the three varieties that make for its world famous wines! Conquer some of the steeper stretches of the region’s hilly landscape and reward yourself with well-earned visits to organic wineries where you will get to taste some of the best and healthiest wines in the area. The tours are rounded off by little detours to scenic lookouts, an exceptional garden and historic castles, with overnights spent at family-owned hotels offering delicious local cuisine.